Candy Bouquet offers exclusive territories based on zip code. Our franchisees have the power to determine their own individual territory and whether they will be store front or home based. Some franchisees stay home for a few months, perfect their bouquets, set up corporate accounts and begin looking for just the right space! Initial investments depend on the size of the franchise owner's exclusive territory and leasehold improvements. Part of the investment also includes the franchise fee that is based on the franchise owner's protected territory. The association fee is a small, set amount like dues that are paid monthly. A Royalty is a percentage of what you make. Candy Bouquet International, Inc. does not charge royalties. Please contact our office for populations or prices on international territories. Training and SupportCandy Bouquet International, Inc., provides the tools you will need and trains you in the techniques that make your franchise so unique. Our franchisees attend extensive training sessions to learn the techniques on making the Original and Authentic Candy Bouquets using the finest candies and accessories. We have an exclusive VIP site, available to our franchisees only; where they can order supplies online, and have access to tons of helpful material both essential and supplemental that are downloaded for free. We also offer two additional correspondence classes that we reward our franchisees to take (Elite Certification and Advanced Certification). Training for Candy Bouquet takes place in Little Rock, Arkansas. The sessions begin on Monday morning and end Friday afternoon. Each franchisee has the opportunity to familiarize themselves with CBI's Distribution Center and purchase from over 2,000 gourmet and specialty items in stock. Additional Training at No Extra Cost! Everyone can learn, with the exception of extreme physical limitations. You do not have to be artistic. Making a Candy Bouquet is similar to playing the piano or learning a foreign language in that you have to become familiar with the basics before you can tackle the more complex designs. A Sweet Choice in Franchise Opportunities! A Candy Bouquet franchise combines fun and profit with a minimum investment and no royalty fees! 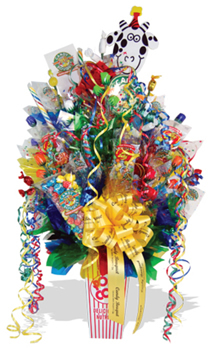 Candy Bouquet arrangements are delicious gift alternatives to flowers and are perfect for special occasions or corporate gifts. Each arrangement can be created in any shape, size, color or theme. The candies are individually hand-wrapped on stems and made into one-of-a-kind gifts. Candy Bouquets won't wilt, fade or die. Retail stores are a combination candy/gift and Candy Bouquet store all in one, thus drawing all different types of traffic to your business! 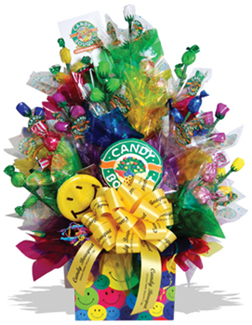 Candy Bouquet franchises can be incorporated with other products to create a business as unique as the person who owns it. Many franchisees stock a variety of gift items such as sugar-free candies and chocolates, gift baskets, bulk candy, balloons or homemade fudge. Others have incorporated their franchise with other products and existing stores such as bakeries, florists, and gift or card shops. 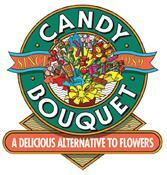 Click on Request Information for FREE info on how to open a Candy Bouquet franchise today! Please Note: This Candy Bouquet franchise opportunity and other franchise business opportunities, businesses and franchises for sale on this web site are not to be considered as an "offering", "franchise offering", suggestion or recommendation by Franchise Leader™. This advertisement depends entirely on the truthfulness of the information provided by our advertisers which includes, but is not limited to, franchisers, franchise brokers, franchise consultants and business brokers. Franchise Leader™ recommends that you consult a lawyer, financial consultant, accountant or professional advisor before buying a franchise or business opportunity or any type of business. By using this form or any part of our website, you have agreed to all terms and conditions of Franchise Leader™. Please review our Terms & Conditions for more information.